Jacksonville Plastic Surgery Reviews and Testimonials about Dr. A.H. Nezami | Board Certified Plastic Surgeon in Jacksonville Florida. 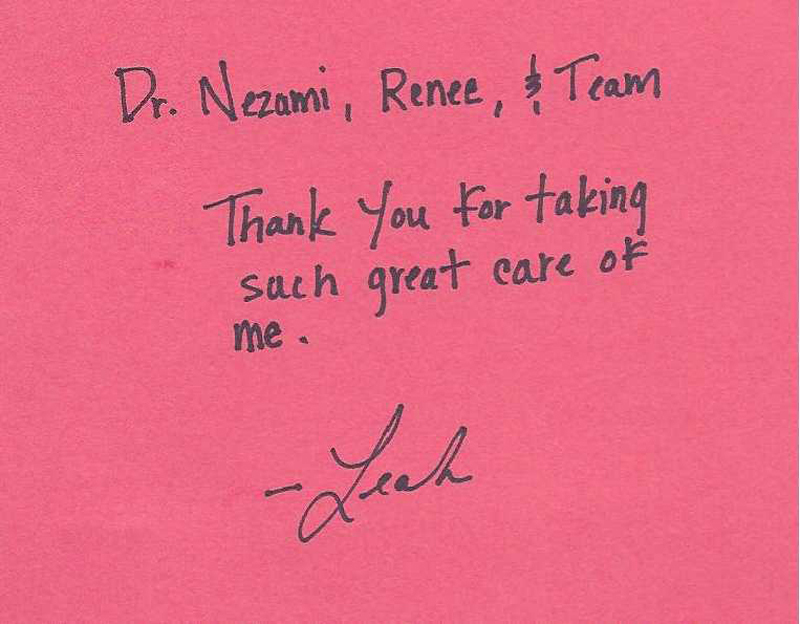 Patients offer their feedback about their experience with Dr. Nezami and the staff at the Jacksonville Cosmetic Surgery Center. Welcome to our practice. 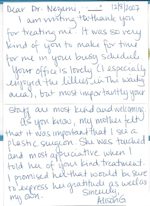 We spend time with our patients and really listen to your needs. Our vision for more than 30 years has been to achieve a high level of patient satisfaction by providing care in a professional and friendly environment. 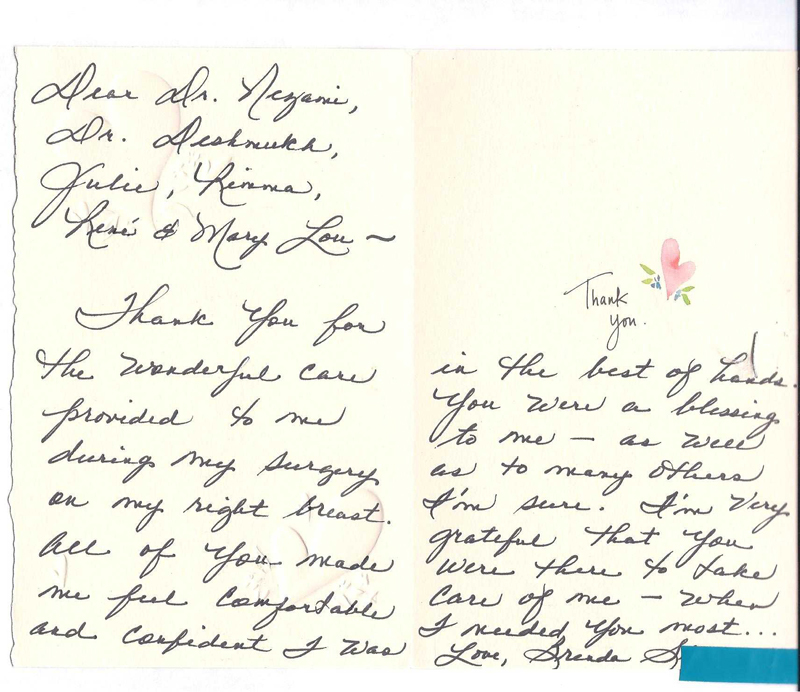 We continue to earn the trust of our patients every day as we deliver excellence in service and a superior value. 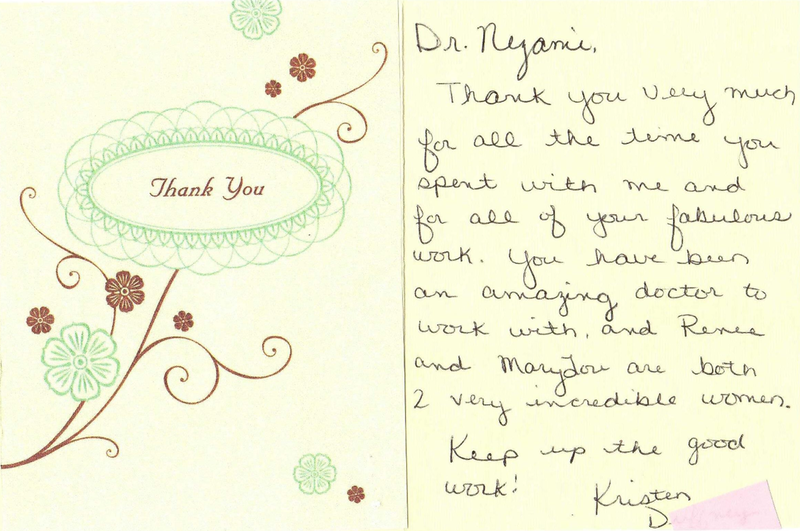 Through mutual trust, warmth, and professionalism, we preserve our patient relationships. 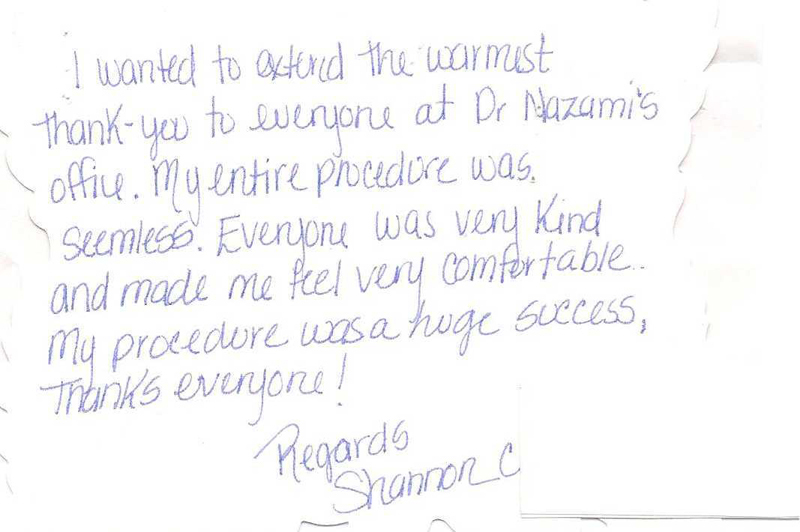 We hope you feel assured and confident in choosing Dr. Nezami and the Jacksonville Cosmetic Surgery Center for your cosmetic procedure. 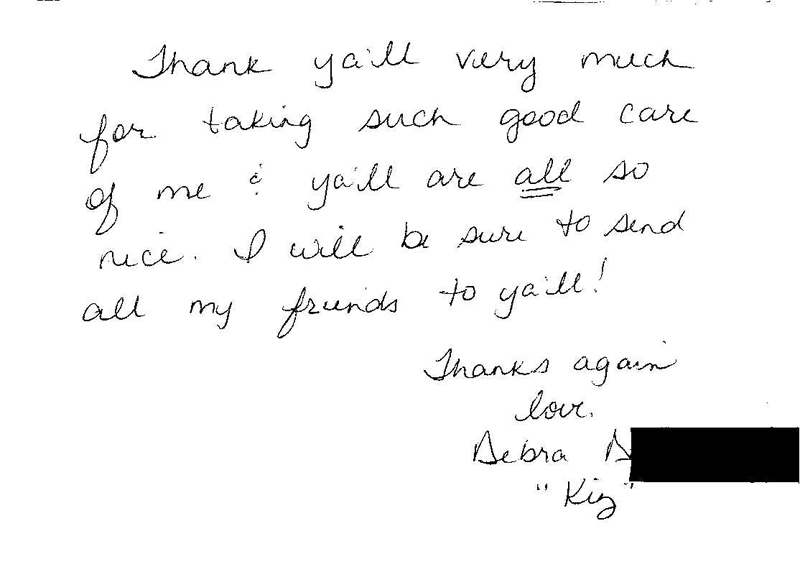 We thank you again for your time and your confidence. * Result may vary depending on each patient anatomy. In light of the fact that I'm rarely at a loss when it comes to communicating my thoughts & feelings (as you well know), I'm finding it profoundly difficult to express just how much you've positively impacted my life. Not only outwardly but inwardly as well. I chose you among other reputable surgeons for a procedure based solely on your credentials; your education, knowledge, decades of experience, and of course your humor. Oh, and monumentally important; your stellar references! 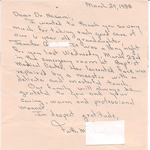 I returned to you, in addition to those mentioned, because of your attention to detail, artistic insight, patience, compassion and concern for not only the procedures undertaken, but for me as a person; an individual... And it showed in everything you did. If there's one thing I do not want to leave this world with, is "regrets", and I can honestly say (post surgery's) that, I can look back... look forward... and look in the mirror without ANY regrets, and smile! So, in conclusion, what can I say in addition to the aforementioned necessary and essential qualities about you? Well, I can call you all the above, but, and most importantly, I can call you a friend. 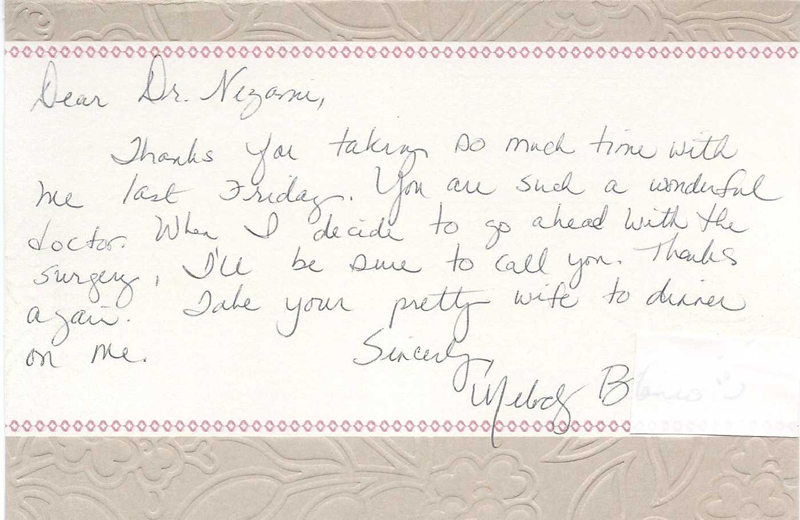 Thank you very much Dr. Nezami for making me beautiful inside and out. P.S. My husband thanks you too. Love & all the best to you now and forever. Your favorite patient and friend. Thank you very much for all the time you spent with me and for all of your fabulous work. 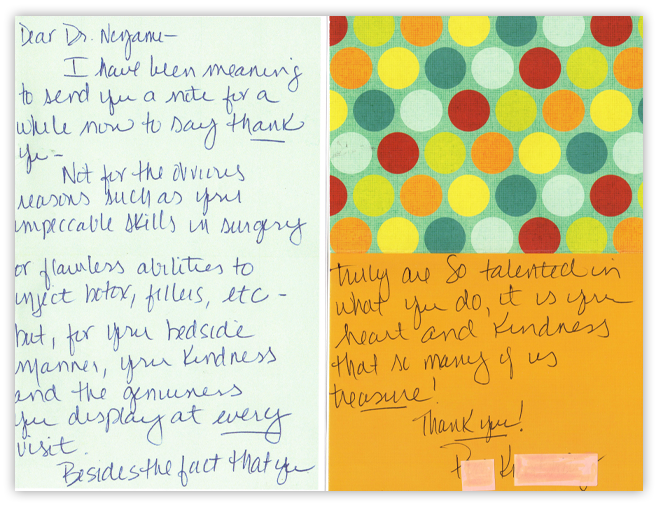 You hav been an amazing doctor to work with, and Renee and Mary Lou are both 2 very incredible women. Keep up the good work! 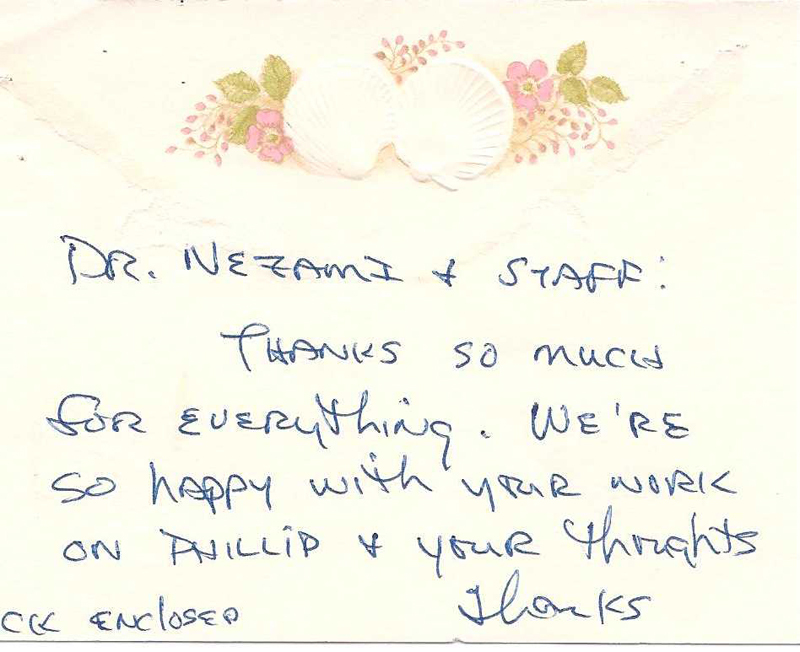 The reason that I went to Dr. Nezami was because of recommendations of two of my friends. One of them was operating room nurse and had seen many doctors in the operating room. I went to his website and I was so impressed by the natural looking results of his operations. 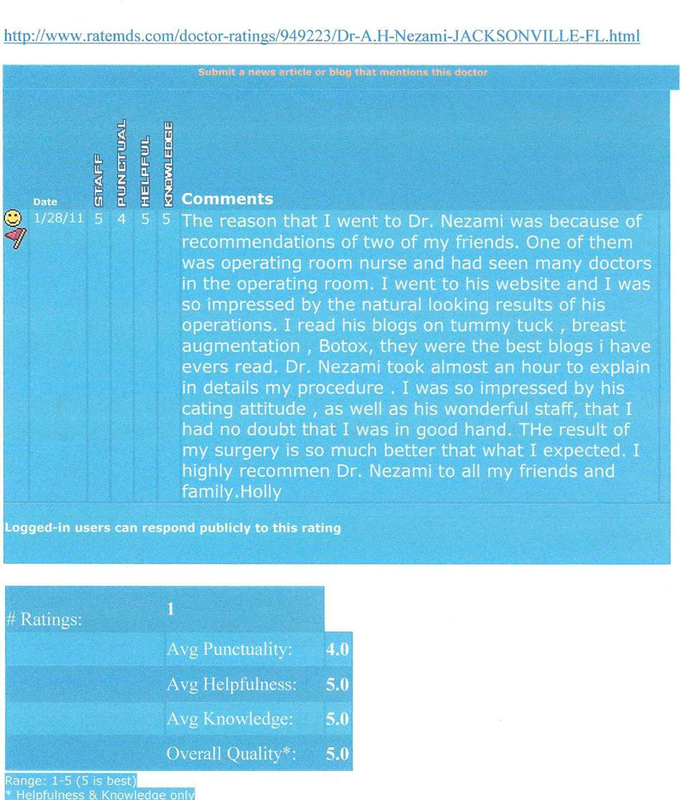 I read his blogs on tummy tuck, breast augmentation, Botox, they were the best blogs I have ever read. Dr. Nezami took almost an hour to explain in details my procedure. 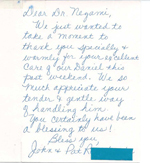 I was so impressed by his caring attitude, as well as his wonderful staff, that I had no doubt that I was in good hand. The result of my surgery is so much better than what I expected. 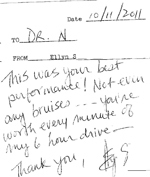 I highly recommend Dr. Nezami to all my friends and family. People like you make the world a better place!! Thanks so much for my wonderful results. I am thrilled. 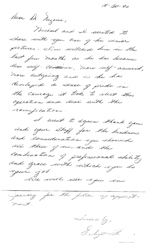 Your professionalism and precision have made you a master of craft. 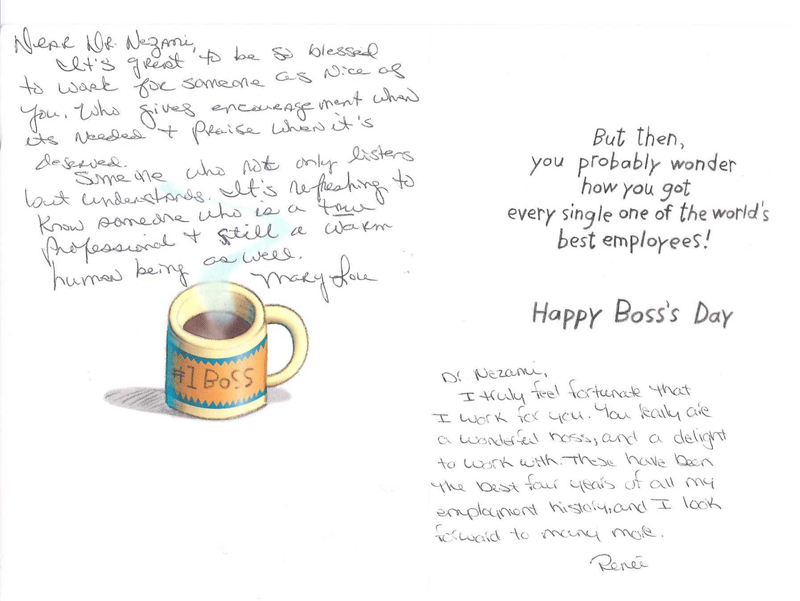 Mary Lou and Renee are equally proficient at their job and were a pleasure to work with. Thank you for being so generous with your time, energy, and most of all, your special talents. Just when I think you’re the nicest person I know, you find a way to be even nicer. Thanks again! 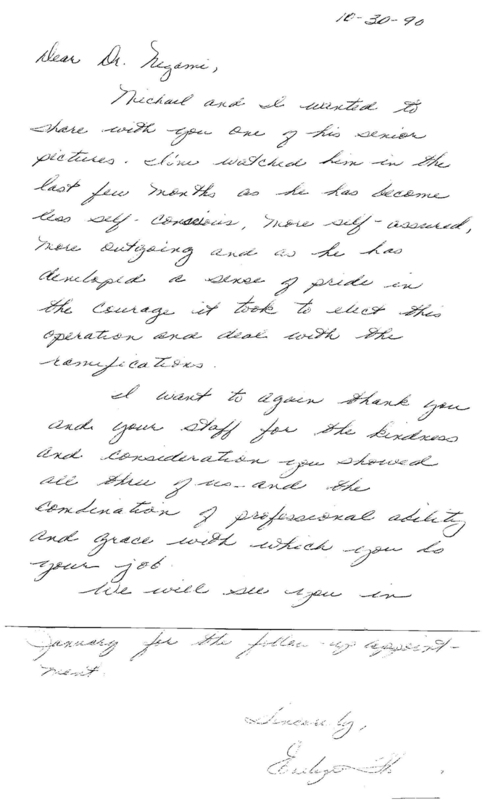 I want to thank you very much for your precious time, and the energy you put in the letter. It means more than you know. You are a kind and talented Dr. and I thank God for you.Wishing you and your family all the health and happiness that life has to offer. 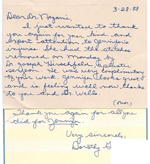 I hope you will not object to this note of thanks. Your kindness to me and concern for my family is appreciated more than I can ever say. You have given me a new respect for the title of “Doctor”. You are the best. Words are certainly not enough to express how grateful I am to you. Your work is phenomenal. 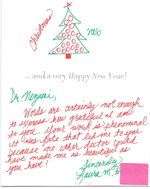 It was fate that led me to you because no other doctor could have made me as beautiful as you have! 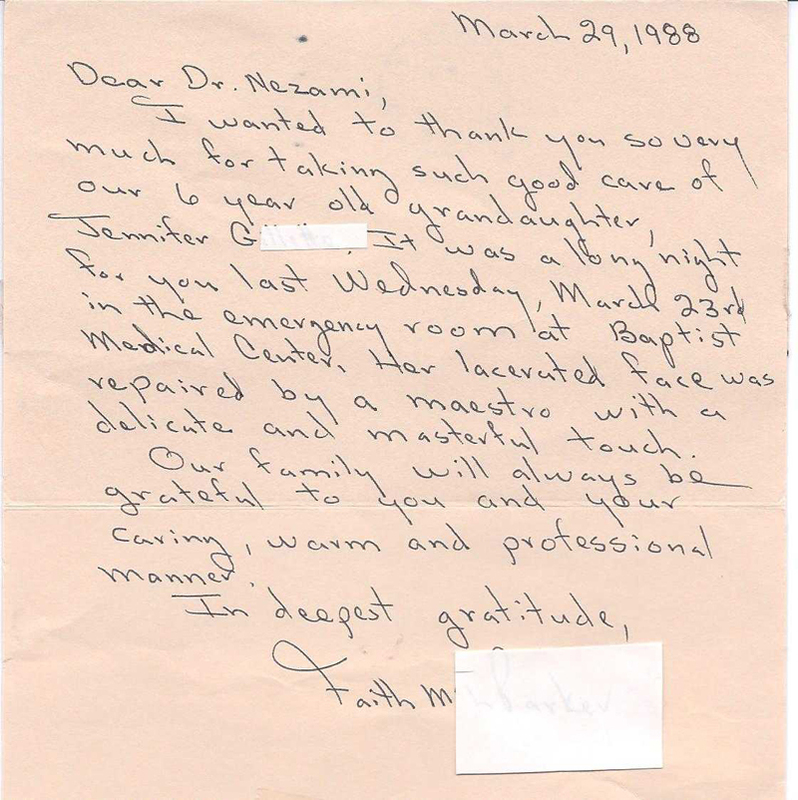 For years I have listened as my parents have praised both your ability as caring and kind doctor and as importantly , a close and personal friend. In the past my family and I have only had a non-medical relationship with you and your family, mostly at parties and at the holidays. Now after my wife, Elizabeth, has seen you for her treatment and hearing her glowing remarks about your care for her, we now know first hand what a truly fine gentleman and doctor we had heard you always are. 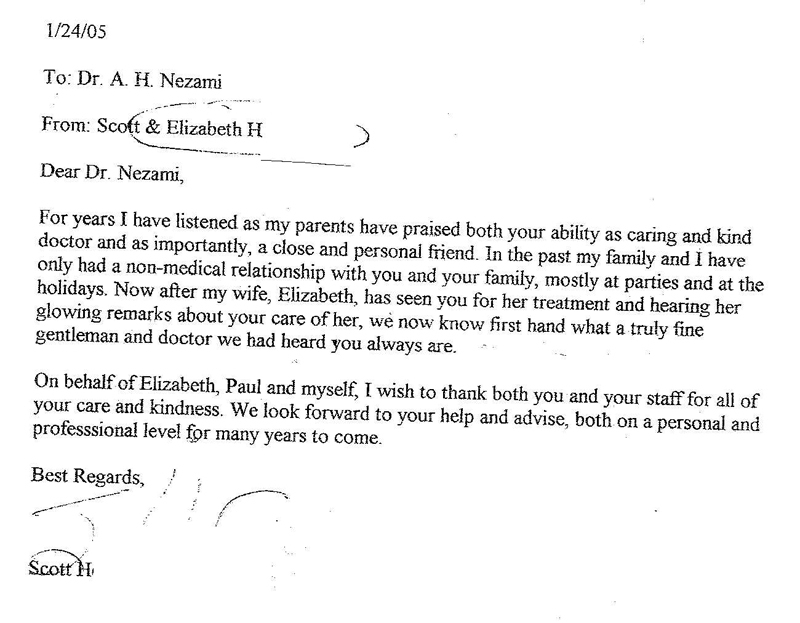 On behalf of Elizabeth, Paul and myself, I wish to thank you and your staff for all of your care and kindness. 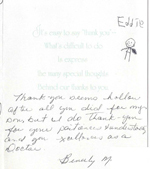 We look forward to your help and advise, both on a personal and professional level for many years to come. 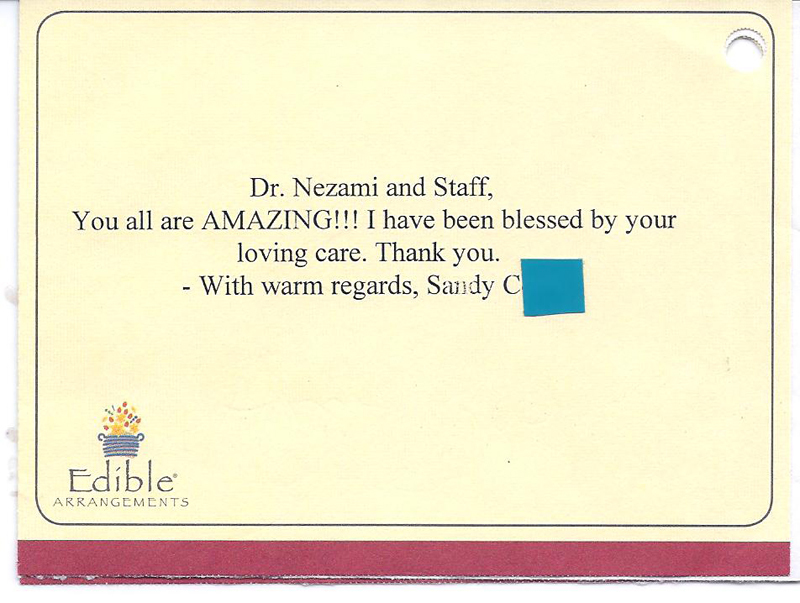 Thanks to Dr. Nezami and his terrific staff for the tender- loving care. This office has gotten it right. 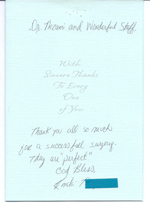 Thank you for the wonderful care provided to me during my surgery on my right breast. 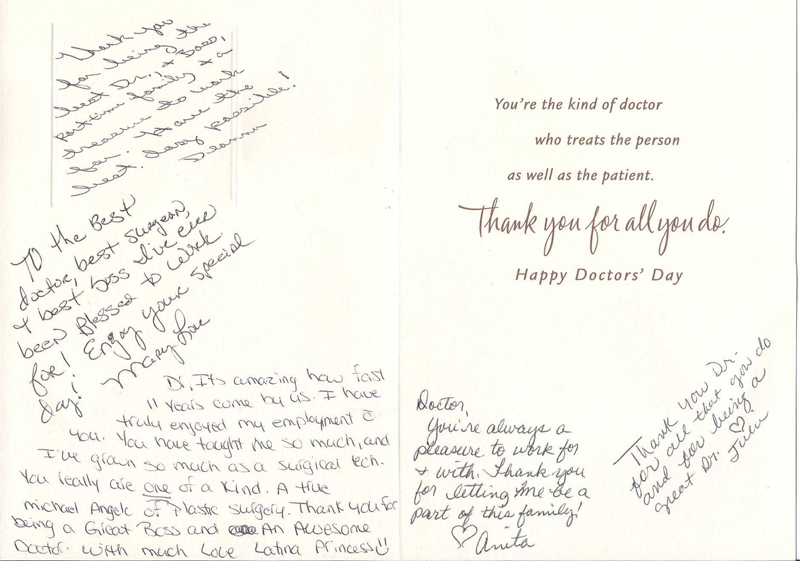 All of you made me feel comfortable and confident I was in the best of hands. You were a blessing to me; as well as to many others I am sure. I am very grateful that you were there to take care of me when I needed you most. 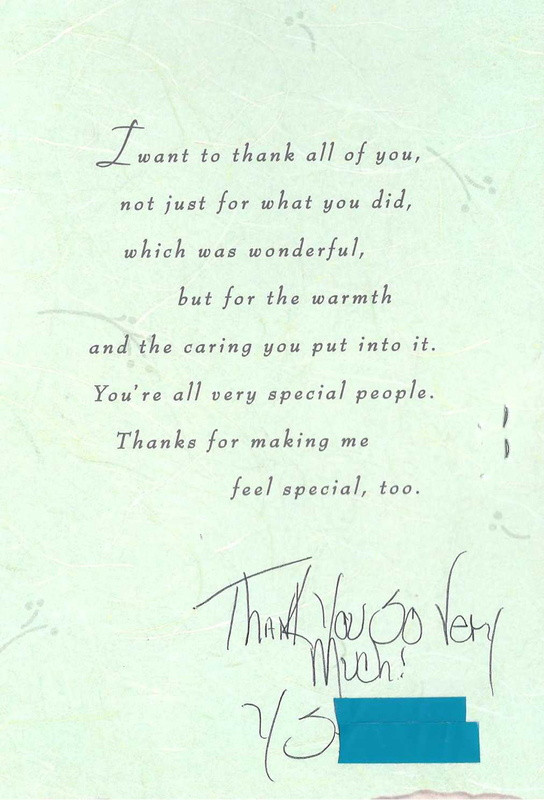 It's easy to say "Thank you" What's difficult to do is express the many special thoughts behind our thanks to you. 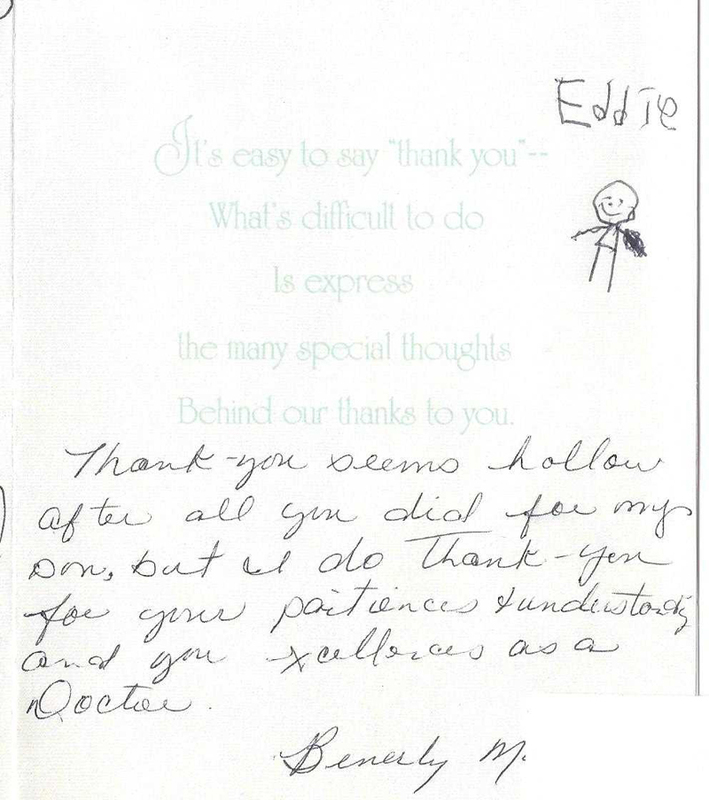 Thank you seems hollow after all you did for my son, but I do thank you for your patience, understanding and excellence as a Doctor. 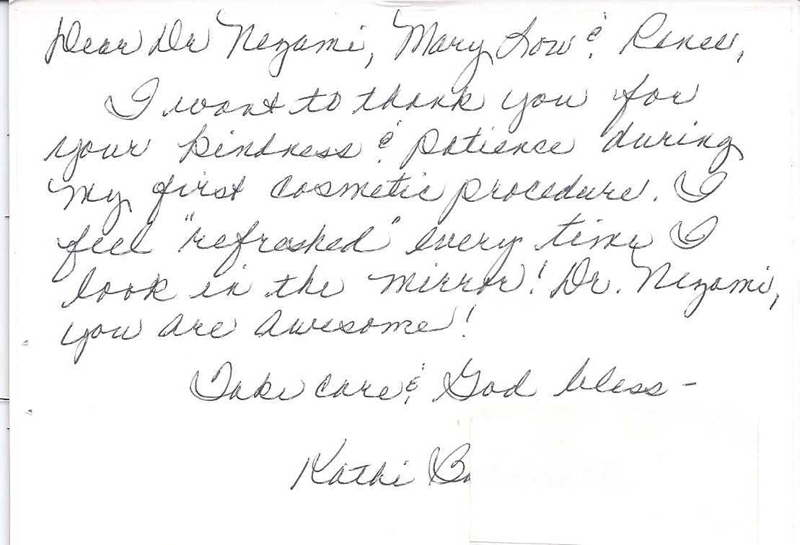 I want to thank you for your kindness & patience during my first cosmetic procedures. I feel “refreshed” every time I look in the mirror! 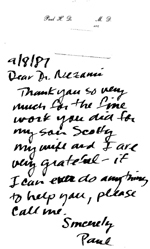 Dr. Nezami, you are awesome! 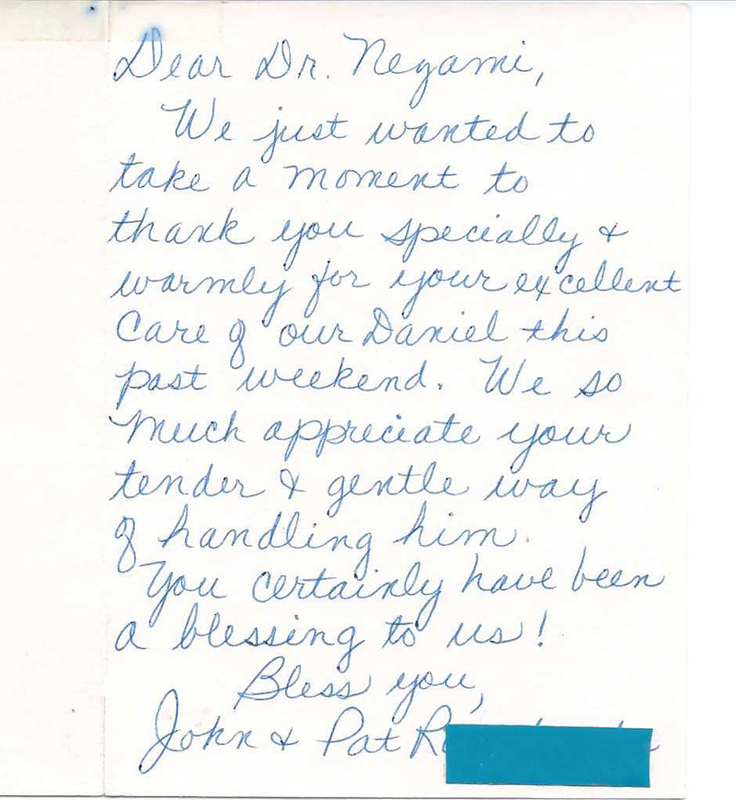 We just wanted to take a moment to thank you specially & warmly for your excellent care of our Daniel. We so much appreciate your tender and gentle way of handling him. You certainly have been a blessing to us! I want to thank all of you, not just for what you did, which was wonderful, but for the warmth and the caring you put into it. You’re all very special people. Thanks for making me feel special, too. It's great to be blessed to work for someone as nice as you, who gives encouragement when it's needed & praise when it's deserved. Someone who not only listens but understands. It’s refreshing to know someone who is a true professional 7 still a warm human being as well. 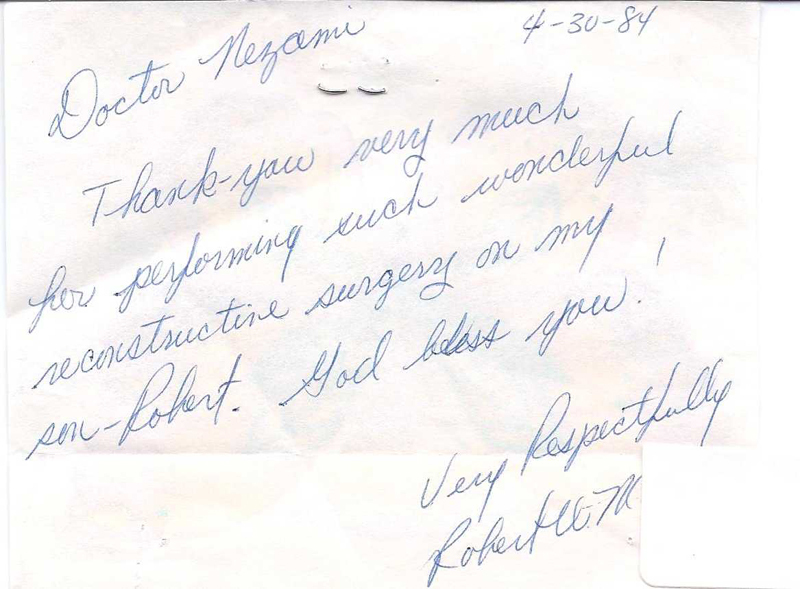 Thank you very much for performing such wonderful reconstructive surgery on my son Robert. God bless you. 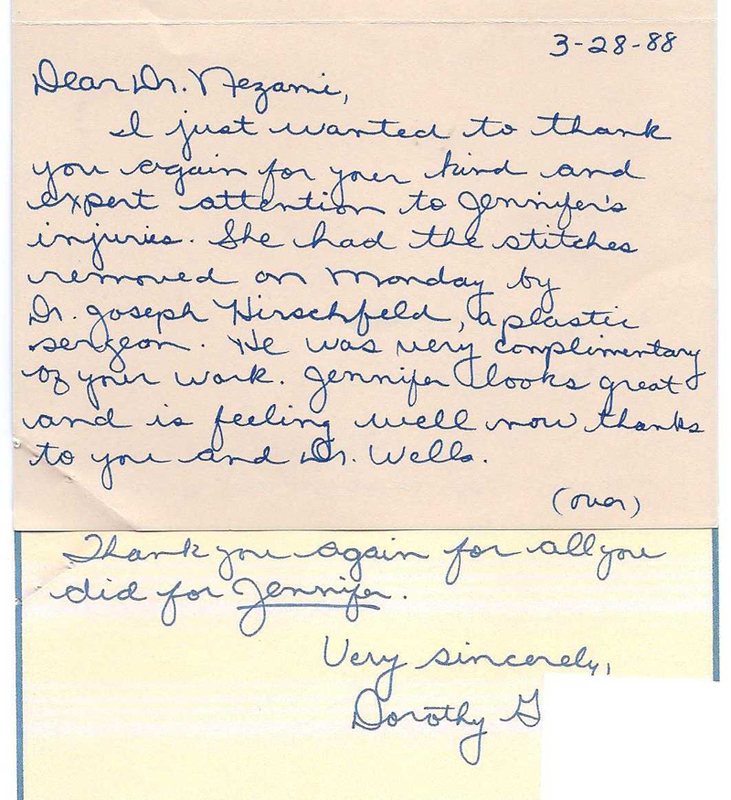 I just wanted to thank you again for your kind and expert attention to Jennifer’s injuries. She had the stitches removed on Monday by Dr. Joseph H. , a plastic surgeon. He was very complimentary of your work. Jennifer looks great and is feeling well now thanks to you and Dr. Wells. Thank you again for all you did for Jennifer. To the best doctor, best surgeon & best boss I’ve ever been blessed to work for! Enjoy your special day! 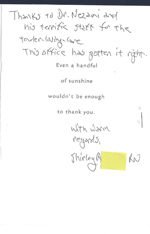 Thank you for your professionalism and your kindness. 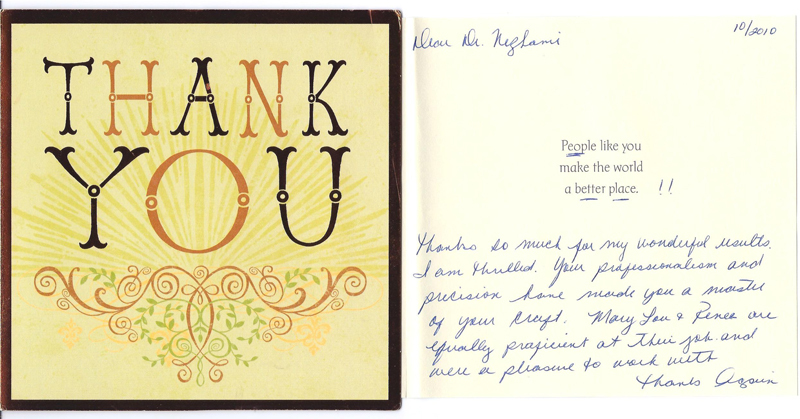 You have a wonderful group of people here who made my experience a most pleasant one! 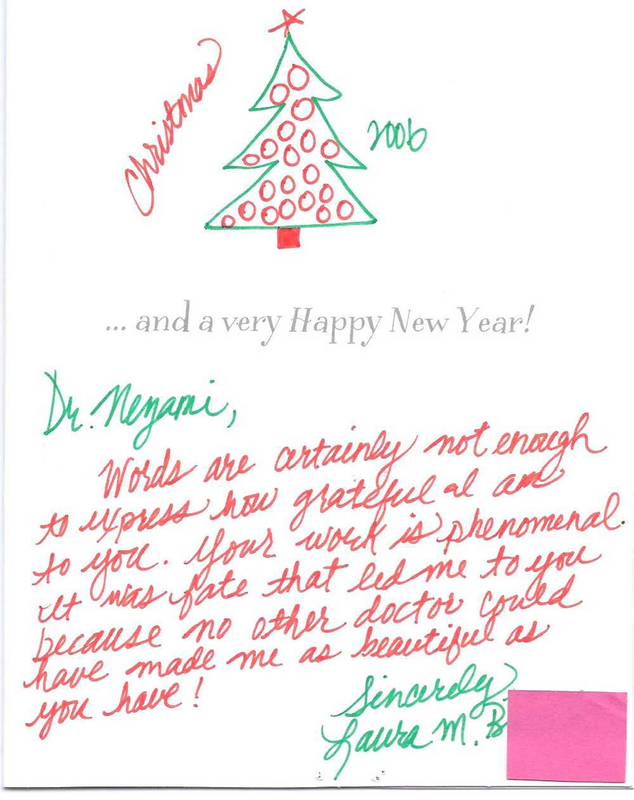 Thank you Dr. for all that you do and for being a great Dr. Thanks so much for making my tummy look great. 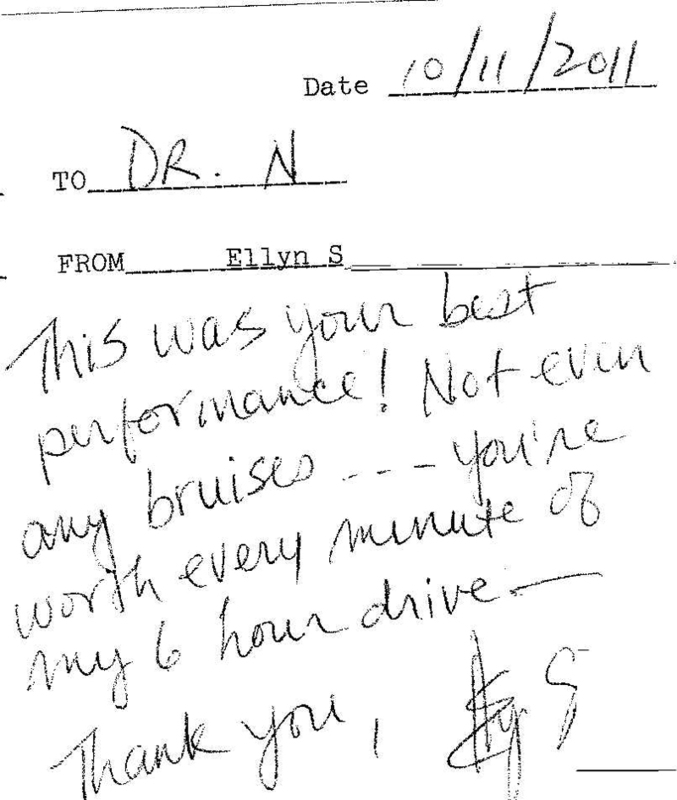 Not only are you a good doctor, you are also very sweet. 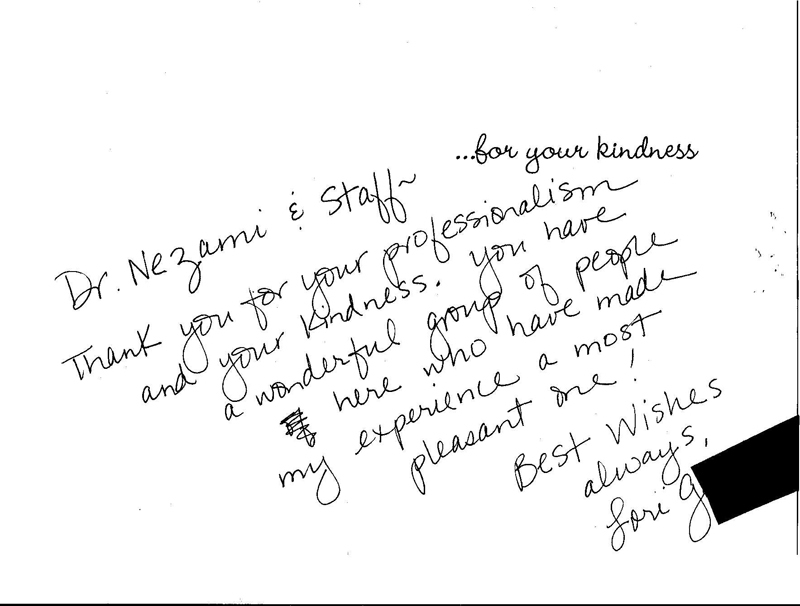 I wanted to extend the warmest thank you to everyone at Dr. Nezami’s office. My entire procedure was, seamless. Everyone was very kind and made me feel very comfortable. My procedure was a huge success, Thanks everyone! Through my traumatic ordeal you always helped me to keep my sense of humor. Hope this little remembrance helps you to keep yours. 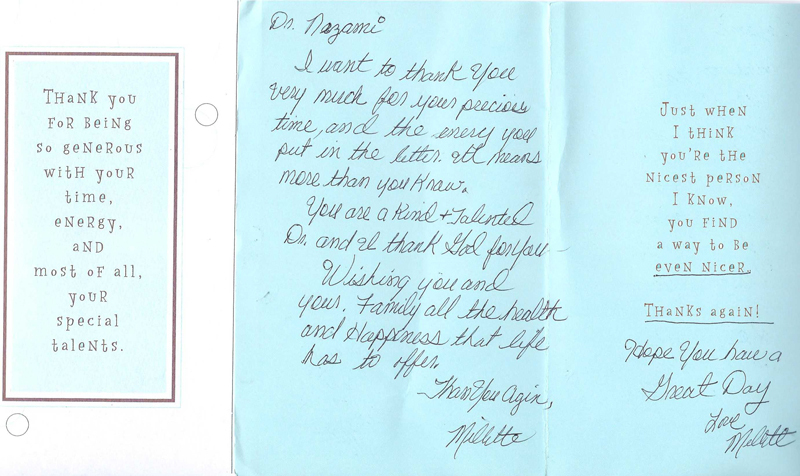 My sincere thanks to you for all your kind and wonderful care. May God Bless you and your family always,Happy Holidays! I wanted to extend a huge thank you to you and your staff. 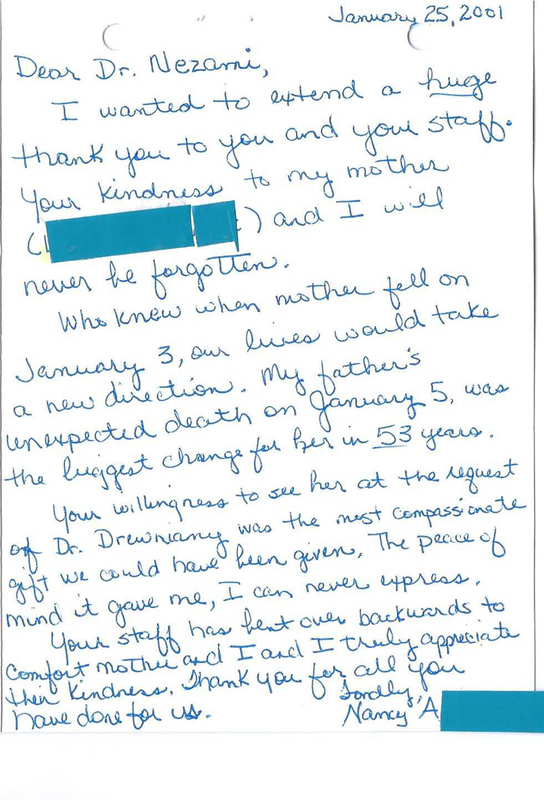 Your kindness to my mother and I will never be forgotten.Who knew when mother fell on January 3, our lives would take a new direction. 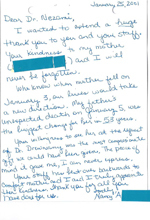 My father’s unexpected death on January 5, was the biggest change for her in 53 years.Your willingness to see her at the request of Dr. … was the most compassionate gift we could have been given, the peace of mind it gave me, I can never express. 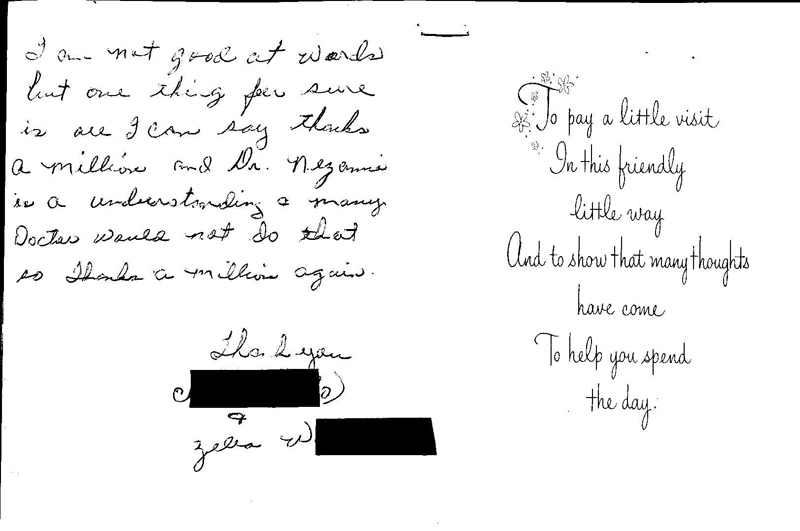 Your staff has bent over backwards to comfort mother and I and I truly appreciate their kindness. Thank you for all you have done for us. Thank you for taking so much time with me last Friday. You are such a wonderful doctor. When I decide to go ahead with the surgery, I’ll be sure to call you. Thanks again. Take your pretty wife to dinner on me. I’m so grateful for your kindness. Thank you. Just want to say my first experience as a patient a very positive one! 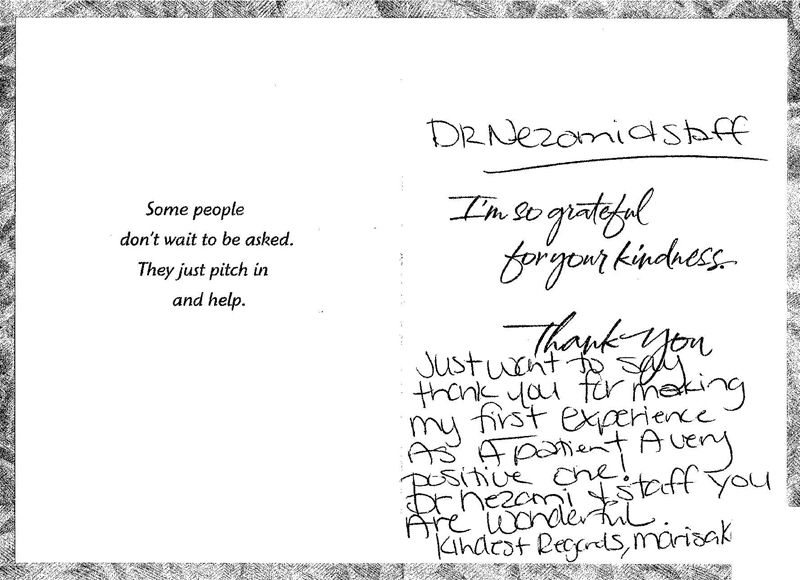 Dr Nezami and Staff are wonderful. 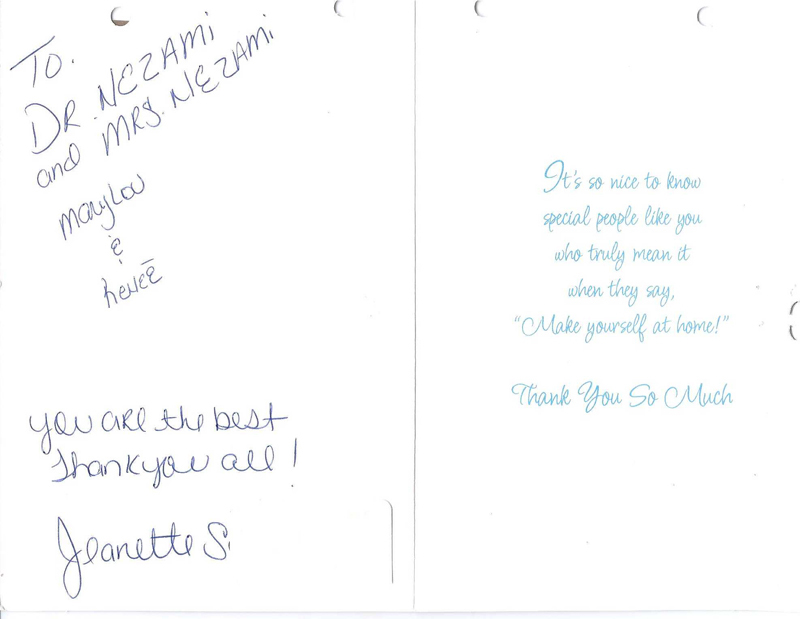 To Dr. Nezami and Mrs. Nezami, Marylou and Renée: You are the best. Thank you for all you do and always being so pleasant! 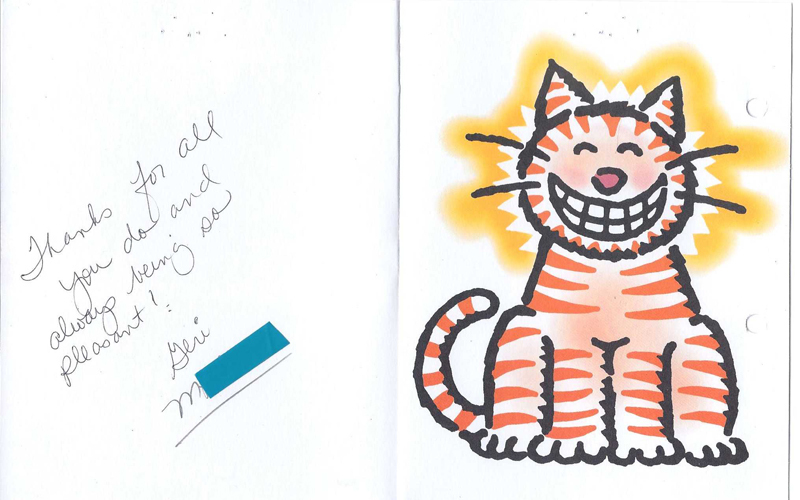 Thank you very much for taking such good care of me and you are all so nice. I will be sure to send all my friends to yall! 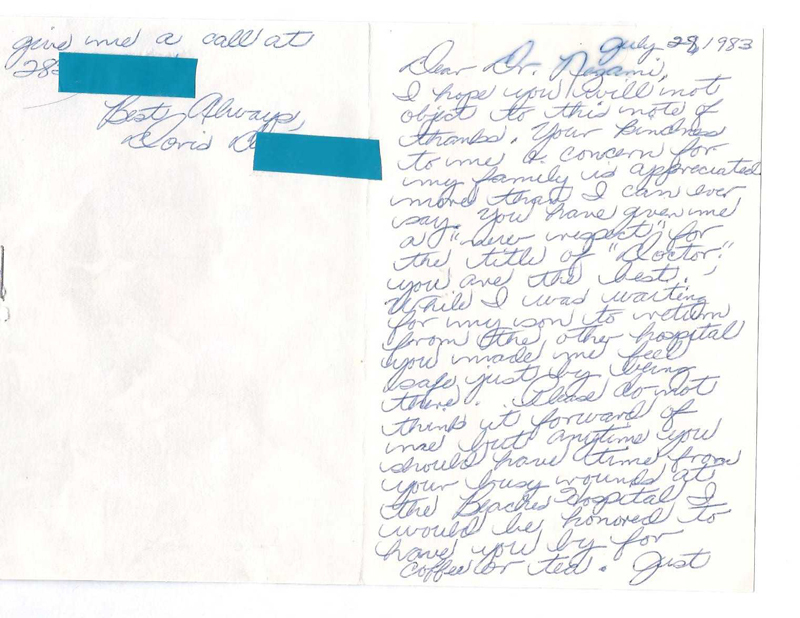 I am writing to thank you for treating me. It was so very kind of you to make time for me in your busy schedule. 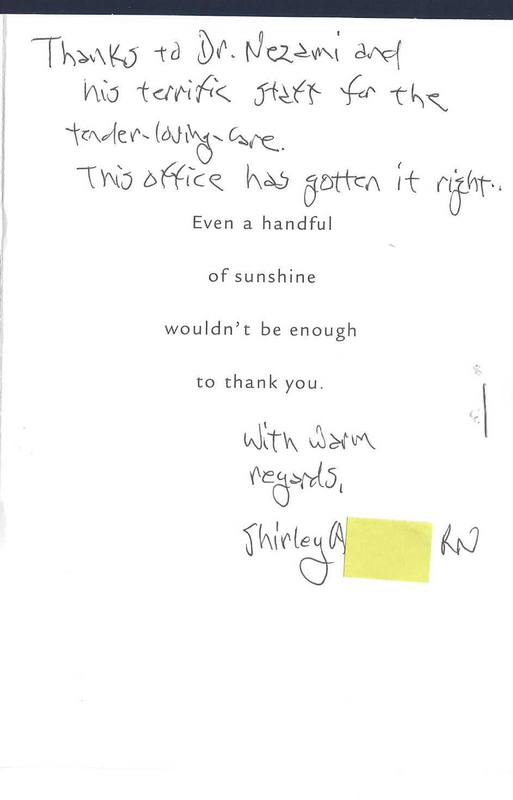 Your office is lovely( I especially enjoyed the lilies in the waiting area), but most importantly your staff are most kind and welcoming. 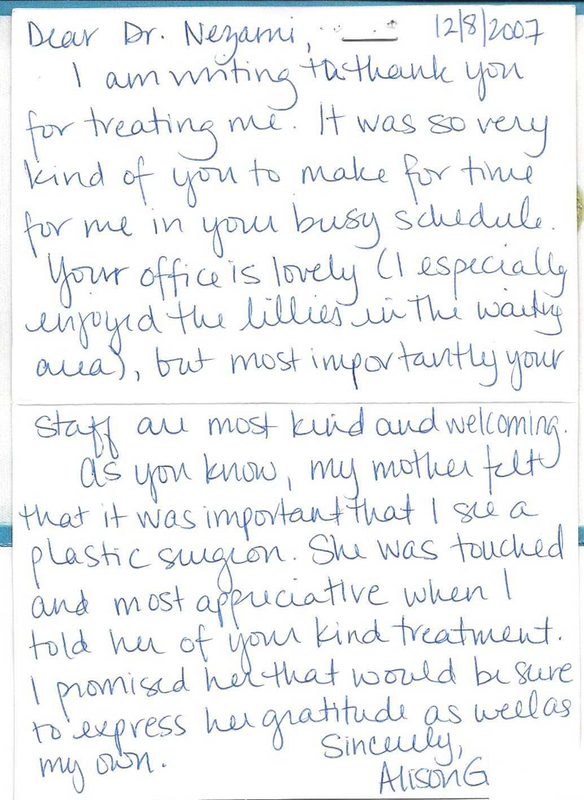 As you know, my mother felt that it was important that I see a plastic surgeon. 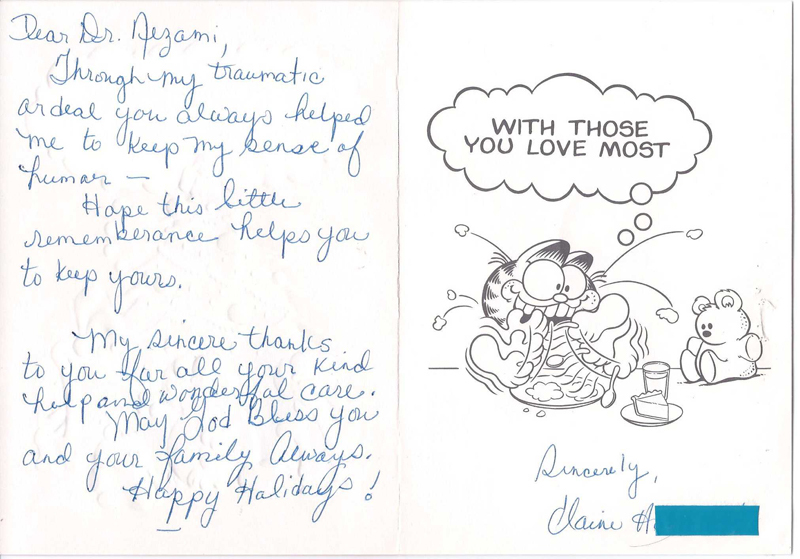 She was touched and most appreciative when I told her of your kind treatment. 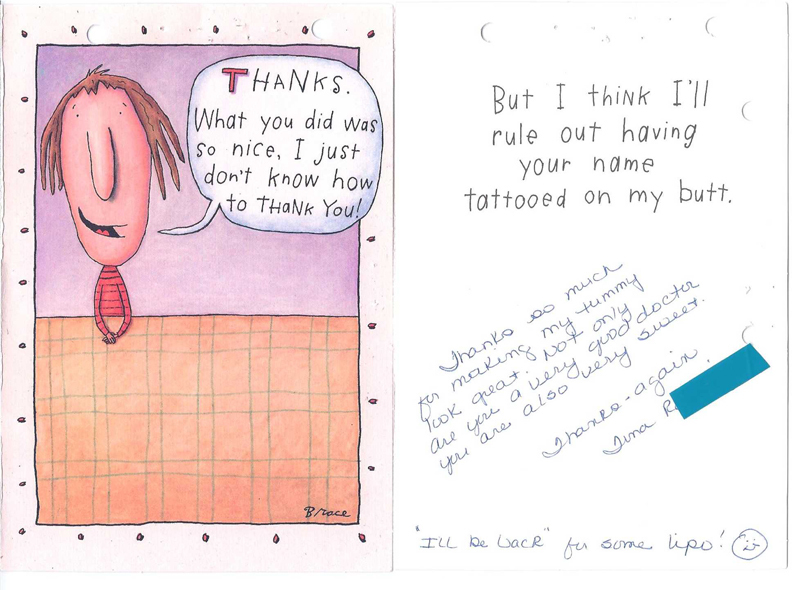 I promised her that I would be sure to express her gratitude as well as my own. 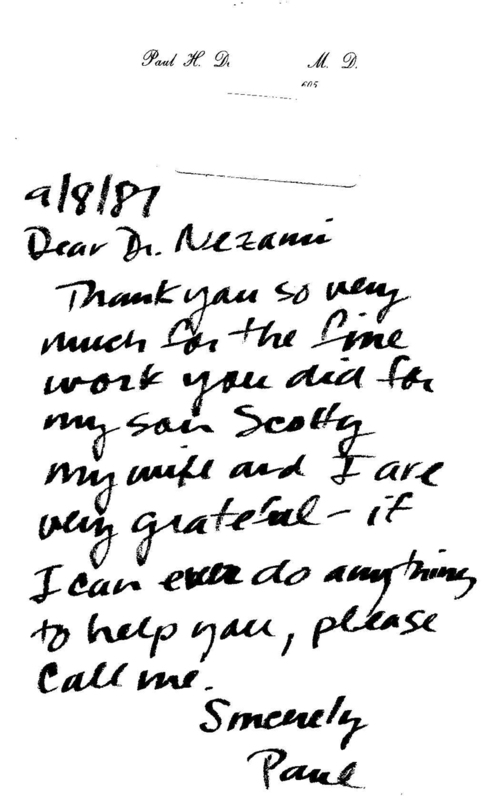 I am not good at words but one thing for sure is I can say thanks a million and Dr. Nezami is an understanding and many doctors would not do that, So thanks a million again. With sincere thanks to every one of you. A nice group of people would be very hard to find. 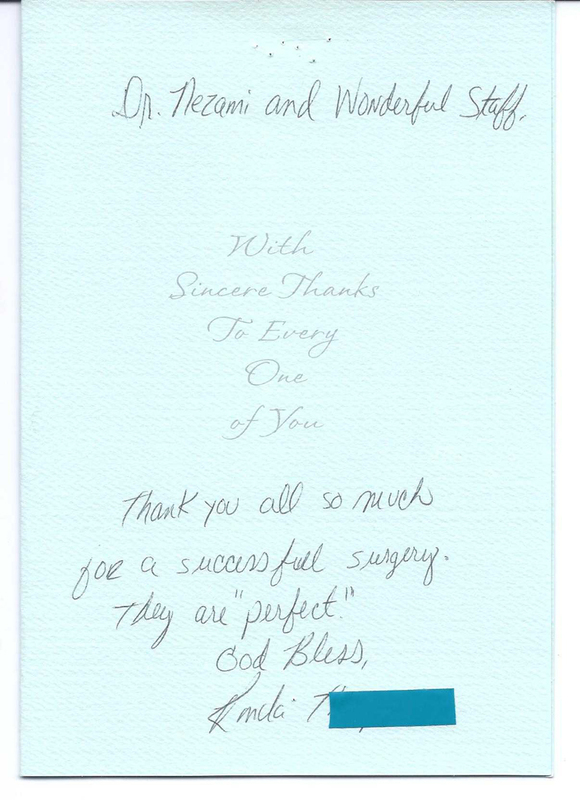 Thank you all so much for a successful surgery. They are “perfect”. You all are AMAZING!!! I have been blessed by your loving care. Thank you. Thanks so much for everything. 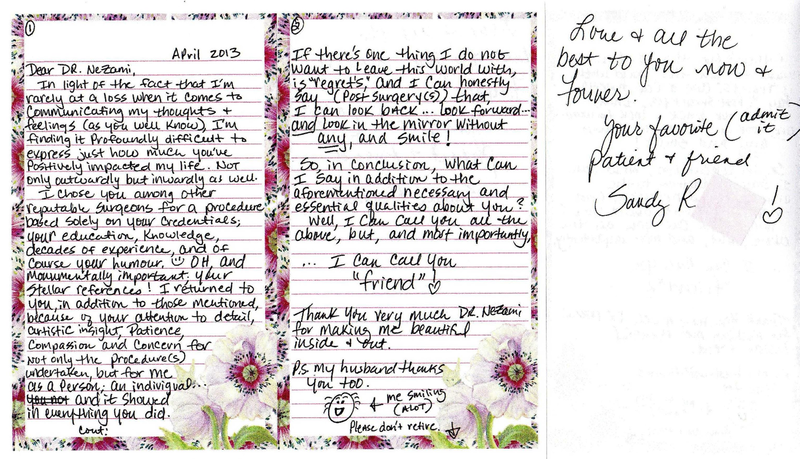 We’re so happy with your work on Philip & your thoughts. * Result may vary depending on each patient anatomy..